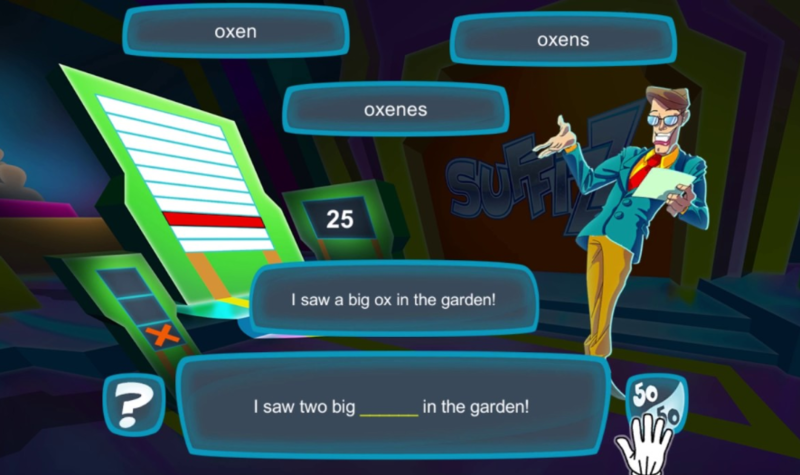 The goal of the game is to help students understand some of the most common suffixes and be able to identify the grammatic type of word (noun, verb, adverb, adjective, pronouns). The core idea is to get children excited about root word modification. It allows students to explore when to add “-s,” “-es,” or “-ies” to the end of a noun. They can also practice with some irregular plural nouns. In addition, students are asked to turn a list of adjectives into comparative and superlative adjectives (“-er”, “-est”, “the more”, “the most”). Via a series of questions, students can strengthen knowledge of nouns, adjectives and pronouns as well as their functions in particular sentences. The teacher can choose which category of questions the student will play. Knowledge of nouns, adjectives and pronouns activities. Understanding some of the most common suffixes and identifying the grammatic type of word.